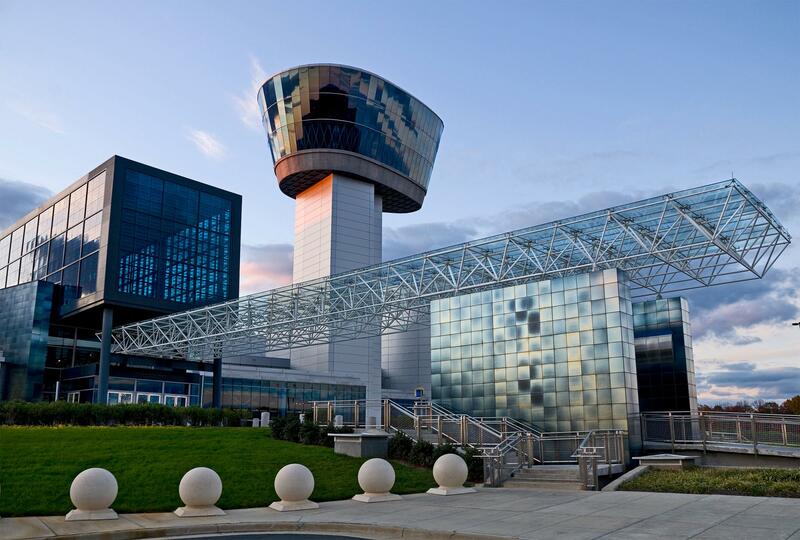 The Steven F. Udvar-Hazy Center near Washington Dulles International Airport is the companion facility to the museum in Washington, D.C. Construction began in October 2000, and the center opened in December 2003. It provides enough space for the National Air and Space Museum to display thousands of aviation and space artifacts that cannot be exhibited in the Washington museum. The two sites together showcase the largest collection of aviation and space artifacts in the world. The center was named in honor of its major donor—Steven F. Udvar-Hazy—and features the large Boeing Aviation Hangar and the James S. McDonnell Space Hangar. In the aviation hangar, aircraft are displayed on three levels. Visitors walk among aircraft and small artifacts in display cases located on the floor and view aircraft hanging from the arched ceiling on elevated skywalks. Among the aviation artifacts on display are the Lockheed SR-71 Blackbird, the fastest jet in the world; the Boeing Dash 80, the prototype of the 707; the Boeing B-29 Superfortress Enola Gay; and the deHavilland Chipmunk aerobatic airplane. Dominating the space hangar is space shuttle Discovery, which is surrounded by satellites and other spacecraft suspended from the rafters and on the floor, and smaller items from the history of spaceflight in display cases. Besides Discovery, visitors can see the Apollo Mobile Quarantine Facility, a Redstone missile, the Mobile Maneuvering Unit, the Mars Pathfinder Lander, a human-size NASA android and the Gemini VII capsule. Many objects in both hangars are on display in a museum setting for the first time. Other features of the Center include the Donald D. Engen Observation Tower, the Airbus IMAX Theater and the Mary Baker Engen Restoration Hangar, where visitors can watch museum specialists at work restoring artifacts. Human Spaceflight—This station highlights the evolution of humans in spacecraft. Highlights include the Space Shuttle Discovery, the Manned Maneuvering Unit, the Mercury Capsule 15B Freedom 7 and the Mobile Quarantine Facility. The National Air and Space Museum’s Mall building is located at Sixth Street and Independence Avenue S.W. The Steven F. Udvar-Hazy Center is located in Chantilly, Va., off of Route 28 near Washington Dulles International Airport. Admission is free, but there is a $15 fee for parking at the Udvar-Hazy Center before 4 p.m. Both facilities are open from 10 a.m. to 5:30 p.m. (closed Dec. 25). Both the museum in Washington and the Udvar-Hazy Center often observe extended hours during the spring and summer, check the website for details.